Free LANEIGE Water Bank Moisture Cream & BB Cushion!! 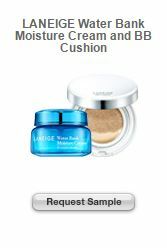 Go HERE to enter your zip code and see if you qualify for a FREE sample of Laneige Water Bank Moisture Cream & BB Cushion. Described on the website as Advanced Water Science Premium Skincare- Hydrate skin for 24 hours with LANEIGE Water Bank Moisture Cream. Perfect skin with exclusive cushion technology from the World’s First BB Cushion.